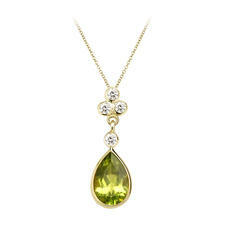 Part of our fine jewellery collection, Aspinal of London's Peridot Jewellery radiates timeless appeal underscored by the simply striking hue of the gemstone itself. Inlaid in 18 carat gold, the two tones combine to create a rich palette, elevated and refreshed by the presence of flawless diamonds. 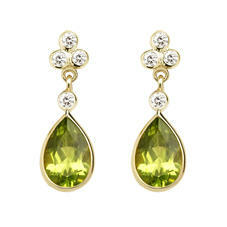 Choose from teardrop cut earrings and the complementing pendant or wear the set for stunning coordination. Each piece arrives in our signature presentation box, making the perfect gift. Every product in the Aspinal of London fine jewellery Peridot Collection will arrive beautifully encased in our signature jewellery presentation box and exquisitely gift wrapped and boxed in our signature gift presentation.